In Alta Anoia you will find a range of rural villages and rural areas very interesting, most of them alive, where the houses you will find, their people, can talk about many generations back working and living in Alta Anoia. It is a municipality located to the western part of the region. The municipality has 223 inhabitants. The municipality of Argençola, is 47.09 km², one of the most extensive in the region, is located west end, bordering the Segarra and the Conca de Barberà. The economy is based above all on agriculture. The cultivated lands are dedicated almost entirely to cereals, along with some vineyards and olive trees. Calaf is a village located at the Altiplà de Calaf. It is the capital of the natural region of Alta Segarra. The municipi consists of 3,475 inhabitants. The municipality with an extension of 9.22 km² is the smallest of the Alta Anoia after Sant Martí Sesgueioles. The economic capital of Calaf was formerly exercised above all with markets and fairs. The “Mercat de Calaf”, so famous that they have made it into the field of folk legends, existed before 1345. It is held every Saturday at the center of town. The municipality of Calonge de Segarra, endowed with a fully rural character, has 200 inhabitants and an extension of 37.28 km2. It is formed by several isolated farmhouses and small towns, such as Aleny, Dusfort, Mirambell, Sant Pere de l’Arç (or Sant Pesselaç), the Soler and the Raval d’Aleny. The municipality is located to the north of the region of the Anoia to the limit with the neighboring districts of the Segarra, the Solsonés and the Bages. The documented history dates back to the 2nd century BC when there is constanzation of a population inhabited by foreigners or those of a colony, such as etymologically indicates its name: “colonicus”, from Latin. Located in the Vall del Llobregós, Anoia region belonging to the Alta Segarra, bordering the province of Lleida with the municipalities of Torà, Ivorra, Estaràs and La Molsosa, and also with the municipalities of Calonge de Segarra and Pujalt belonging to the province of Barcelona. The town is of medieval origin and born in frontier lands, at the bottom of a castle that still today stands majestic and emblematic among its own ruins. The economy of the town is based on agriculture, industry and services. The municipality is located northwest of the city of Igualada, capital of the region of Anoia. Account with an extension of 18,7 km2 that limits to the north with the towns of Veciana and Rubió. To the south it limits with the town of Jorba and to the west with the municipality of Sant Guim de Freixenet, of the Segarra. A quiet stroll through the streets of Copons conveys that we are surrounded by history. A large number of noble houses, facades with large ornaments of cut stone tell us of centuries of prosperity. The municipality of Els Prats de Rei, of 32.76 km: of extension, with latitudes that oscillate between 600 and 700 meters above the sea level, is located at the “altiplans segarrencs”. The municipality is formed by the village dels Prats de Rei, and by the urban nuclei and small towns such as La Manresa, Solanelles, Puigdemàger, Seguers and La Quadra del Galí. The municipal land of capricious and irregular forms, limits with Calaf, Sant Martí de Sesgueioles, Pujalt, Veciana, Sant Pere Sallavinera, Aguilar de Segarra i Rubió. Pujalt is to the north of the region of l’Anoia, to the limit of the province of Barcelona and together with the region of La Segarra. The extension of Pujalt is of 31.43 km ² and with about 200 inhabitants, to about 750 m of altitude. But the municipality of Pujalt is also the set of small towns such as: l’Astor, Conill, La Guàrdia Pilosa, Vilamajor and Pujalt, which with their stone houses, narrow streets and narrow access retain all their charm. The municipality has 229 inhabitants and covers an area of 48 km². It is one of the municipalities with more extension of the Alta Anoia, and at the same time has the smallest population of the area. Rubió has a very mountainous terrain, being its peak the Sierra de Rubió, at 837 m.
The municipality limits with the towns of Castellfollit del Boix and Aguilar de Segarra, Els Prats de Rei, Copons, Jorba and Òdena. It is located in the northeast sector of the region, on the border with the Bages region. It has an area of 3.8 km2 and has about 400 inhabitants. The town of Sant Martí, 646 m. Of altitude, it is near the last steps belonging to the Altiplà de la Segarra, with the gentle slopes of a small valley that embraces one of the heads of the river Anoia, which crosses the town in the middle. The municipality limits, from the North and turning clockwise with the municipalities of Calaf, Els Prats de Rei and Pujalt. With an area of 21.95 km2, it extends along the southern slopes of the Sierra de Boixadors. The most characteristic element of this municipality is that of Boixadors, documented since 1014. Located at 848 m height, it is visible from almost all the Alta Anoia. 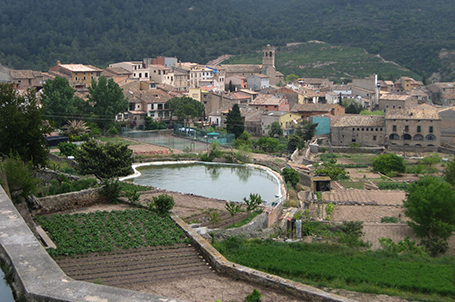 The population of 167 inhabitants, lives distributed in diverse small rural towns as they are; Sant Pere Sallavinera, the Llavinera, the Fortesa, Boixadors and the Querosa, and also in isolated farmhouses. It is the only population in the area that has an important forest massa. The extension of the municipality is of 38,89 km2, with a population of 173 inhabitants, distributed in six small towns, as well as in multitude of masias. Veciana, located at the center of the municipality is where the town hall is located. Segur, is located at 780 meters of altitude which offers some fantastic panoramic views of Calafí altiplà. The remaining towns of the municipality are; Montfalcó el Grós, Sant Pere del Vim, Santa Maria del Camí and La Rubiola.